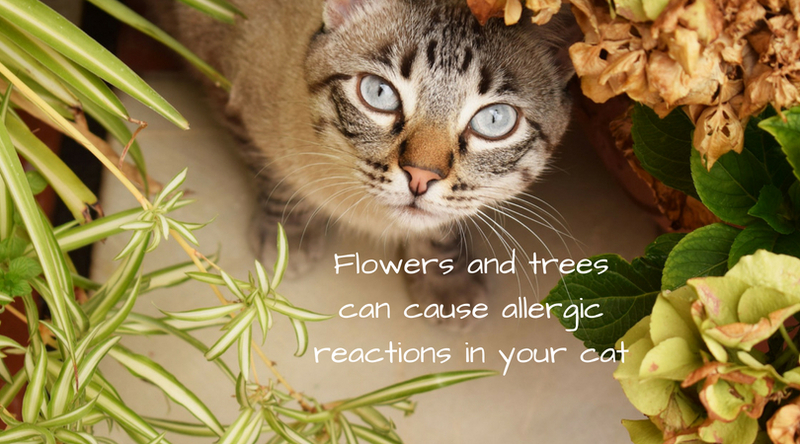 Did you know that cats, even those who stay indoors, can suffer from allergies? Signs of allergies in cats can be similar to common signs in dogs, including itchy, inflamed skin. You may recognize signs that are a lot like your own, too, such as sneezing or nasal discharge. You might even notice stomach upset, including vomiting or diarrhea. While each of these could be symptoms of several sorts of conditions for your kitty, allergies may be to blame. There are four types of allergies that cat owners should know about. Imagine a reaction in yourself to something like poison ivy: You come into contact with an item or substance that causes skin irritation, itching, and/or inflammation. This can happen in your feline friends as well. It isn’t necessarily common, but instances “of contact allergy include reactions to flea collars or types of bedding, such as wool” (source). Tracking down the source of your cat’s contact allergy can take time and patience, but we’ll work with you to find that itchy irritant. Like contact allergies, food allergies in cats are not exactly common. When they do occur, they often mirror other conditions, including contact allergies or general gastrointestinal distress. And, like contact allergies, a good diagnosis will take teamwork and time. Proteins are the most likely food allergens: beef, chicken, turkey, and surprisingly sometimes even fish. A special diet will be part of the detective work so that you and the veterinary team can observe your cat’s condition in the absence of suspected allergen proteins. We’ll help you create a careful plan, but you’ll need to follow it closely. Tufts University strongly cautions that a special diet should be “THE ONLY FOOD OR FLAVORED THING TO GO INTO YOUR PET’S MOUTH for at least a month but potentially several, depending on your pet’s history and type of issues.” If a suspected protein is introduced at the wrong time, the trial period will have to begin all over again -- and it could set off another reaction in your cat. 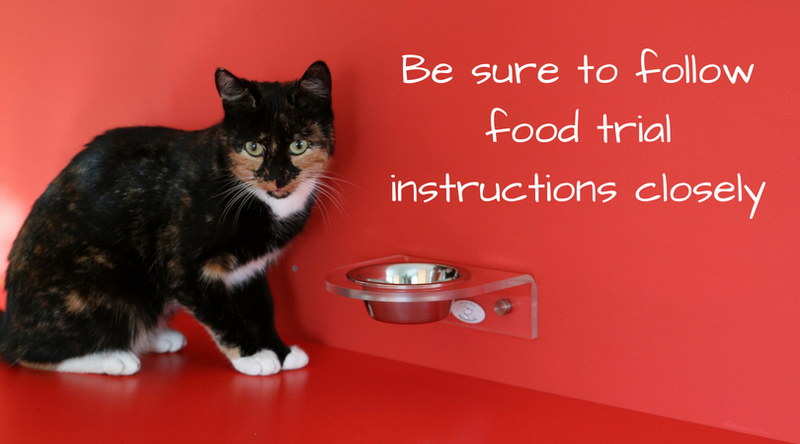 The strict testing period will be worth it if we can work together and find a regular diet that doesn’t make your kitty itch or feel sick to her stomach. And we’re happy support you during the process. Just contact us with any questions! the veterinarian may prescribe any of several available systemic medications, such as: an antibiotic (a substance that can inhibit or destroy the growth of invasive microorganisms); a corticosteroid (a hormone often used to moderate an immune response and reduce inflammation); or an antihistamine (which inhibits the action of the chemical agent whose production causes the release of fluids into the tissues of an affected cat that can lead to inflammation and itching). And don’t forget, you would need to diligently treat your home to rid your kitty’s environment of fleas, larvae, and eggs. Breathing in pollen, mold, dust mites, and other “inhalants” is a recognizable trigger for people with allergies. And whether seasonal or environmental, these inhalants can be just as irritating for your cat. Known as “atopy,” an inhalant allergy can cause skin irritation and itch in your cat -- much like the other allergies we’ve explored. If you notice otherwise unexplained itching in your cat, particularly if it lasts for just a couple of weeks or shows up during the same seasons, your pet may be reacting to what she’s breathing in. There are options for treatments that can provide relief to your kitty. In more mild cases, we might prescribe medications to control the itch just during the seasonal window. We may dispense a shampoo that can help soothe the skin and clean pollen or other particulants off of the fur. Bear in mind that we may need to see you and your cat in the office to reassess the condition, especially if the flare-ups don’t have a discernible seasonal pattern. You may have never realized how closely allergies in cats may parallel allergies in people, and unfortunately, both felines and humans can be equally miserable when allergic reactions strike. Because pets can’t tell us exactly what they ate, touched, or inhaled before a reaction, it usually takes a close working relationship between pet parent and veterinary team to get to the bottom of things. The good news is that we’re happy to be there for you and your pets; be sure to contact us if you suspect allergies in your cat.